It’s nothing mind-blowing from the outside, but if you know how to read your MidCentury vocabulary, you can tell there’s going to be great things inside. St. Priscilla Church (6949 W. Addison, 1957) does not disappoint. 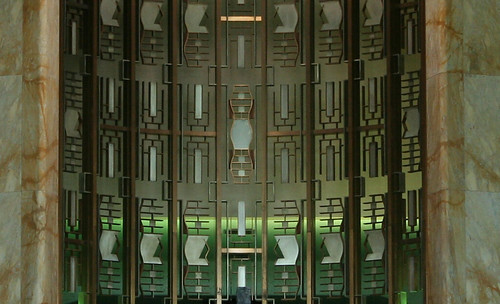 The entry hall is a long, narrow rectangular space, which extends beyond the main body of the building to form the baptistry, demarcated only by gates. 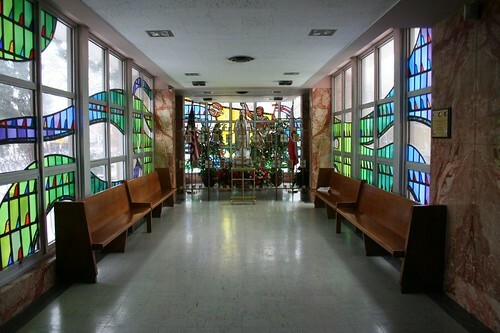 This thin structure has walls of stained glass on both sides, with bold, flowing abstract designs that alternate large areas of clear glass with color. 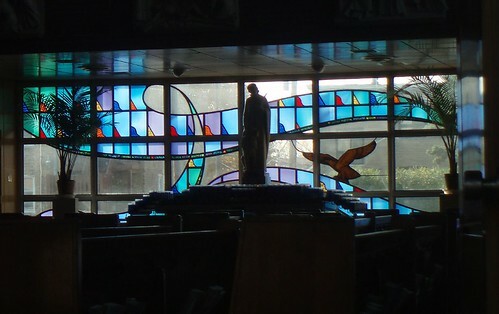 Below, the stained glass windows continue the same sweeping wave-like forms seen in the chapel. 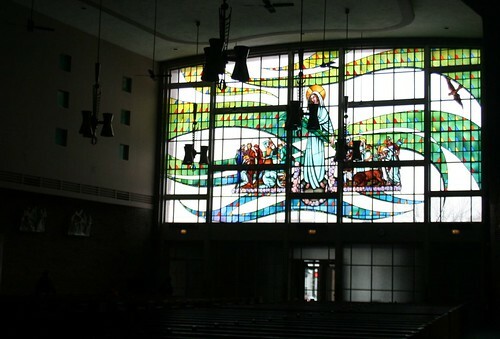 And the motif culminates in the rear window, where Saint Priscilla herself presides over the sanctuary. 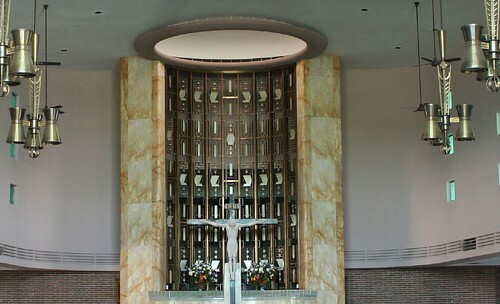 Behind the altar, a massive metal screen rises up to a round skylight. 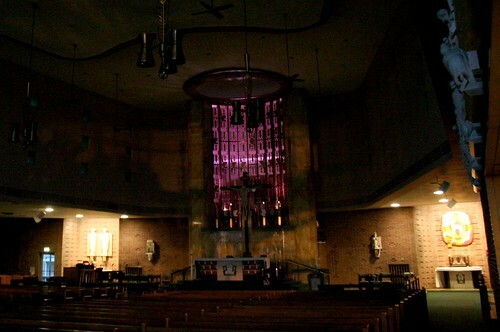 The sanctuary can be a rather moody place, depending on the time of day and how many lights are left on. But it is always beautiful. The siting of the church lends it additional presence – it sits at the head of the T-shaped intersection of Addison and Sayre. A school and newly completed convent already stood on the site in 1956, when Rev. Aloysius Hinterberger led the drive for a new building. 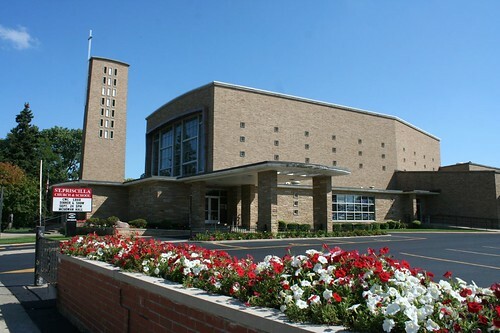 Fund raising for the church building began based on a budget of $750,000 (later upped to $900,000). The new building was constructed by Charles B. Johnson & Sons, the general contractor. 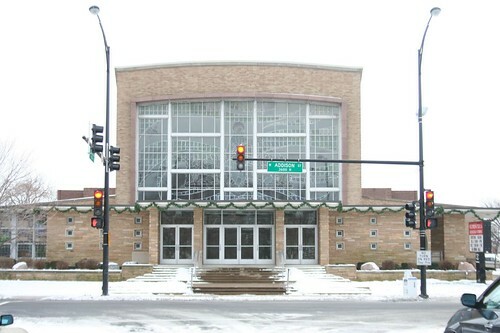 The new structure was dedicated on Christmas Eve, 1957. Among it better known congregants was builder Albert Schorsch, who developed large swaths of northwestern Chicago. 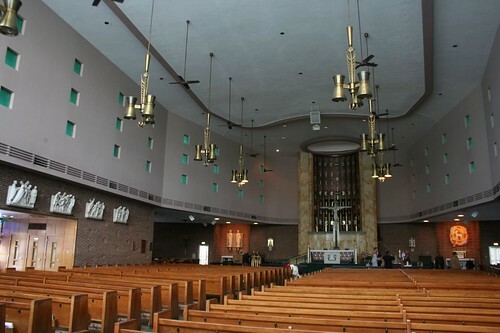 Today St. Priscilla Catholic Church provides Mass in both English and Polish. 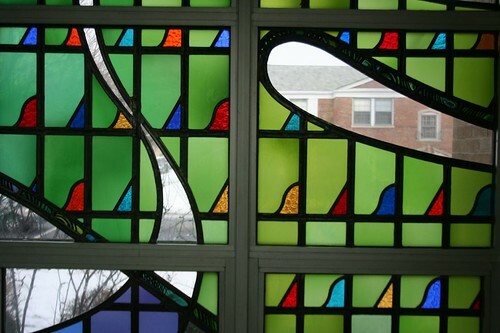 This entry was posted in Midcentury churches, Stained Glass. Bookmark the permalink. Lovely pictures of a lovely church. 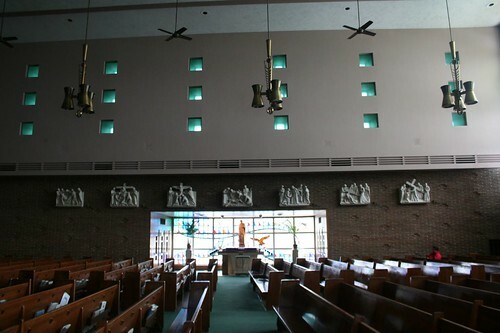 I personally like mid-century modern churches. I think they at least attempt to bring a modern face to an ancient institution. They fulfill the promise of Vatican II.